After inquiring about specific edits that could be made, Variety’s Director of Strategic Partnerships Patrice Atiee elaborated that: “The topic is too sensitive at this time and we will not be in a position to add it to next week’s edition.” According to Atiee, the ad was run by the senior team at the company (legal, operations, editorial) and the decision was made by publisher Michelle Sobrino. 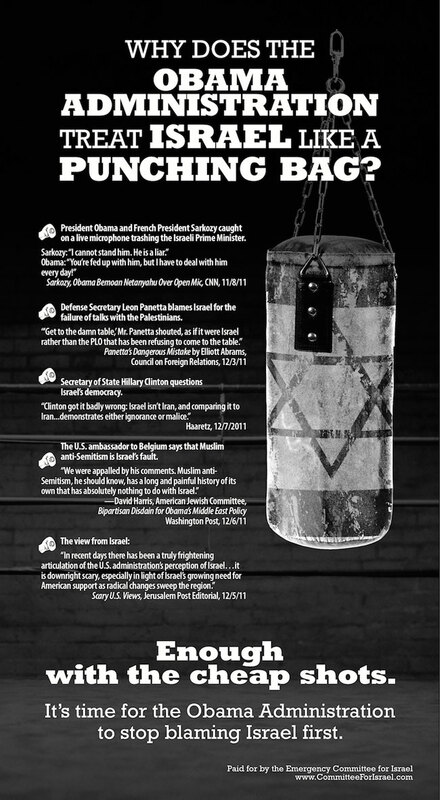 Munayyer is referring to an ad from the Emergency Committee to Protect Israel that was published by Variety on December 15, 2011, according to the Committee’s website. 2016 Oscar nominees Mark Rylance and Asif Kapadia have already pledged not to visit Israel professionally as long as the human rights violations persist. Last week, five-time Oscar nominee Mike Leigh, director Ken Loach and musician Brian Eno publicly denounced the Israeli government’s propaganda initiative, which is being promoted by Israeli Tourism Minister Yariv Levin, a vocal proponent of Israel’s illegal settlement project opposed to the creation of a Palestinian state. The Israeli government is sponsoring the $55,000 all-expense paid, 10-day luxury travel pack with first-class air to Tel Aviv that is included in swag bags for Oscar nominees in the best actor/actress, best supporting actor/actress, and director categories. This year’s host Chris Rock is also set to receive one. Getting celebrities to come to Israel is part of a “Brand Israel” strategy by the government to improve Israel’s image abroad in the face of growing boycott, divestment, and sanctions campaigns (BDS) that challenge Israel’s military occupation and apartheid policies towards Palestinians. “The Israeli Tourism Ministry wants glossy photos of stars in entertainment magazines to brand Israel as a sunny tourist destination, rather than a state enforcing occupation, discrimination and apartheid,” said Vilkomerson. “The nominees now have an opportunity to take a stand for human rights by refusing to allow themselves to be used in Israel’s PR campaign,” said Vilkomerson. A petition launched last week urging nominees to follow the lead of celebrities like Ms. Lauryn Hill, Danny Glover, Stevie Wonder, Elvis Costello, Angela Davis, and others who have refused to lend their names to Israel’s past propaganda attempts already has over 5,700 signatures. 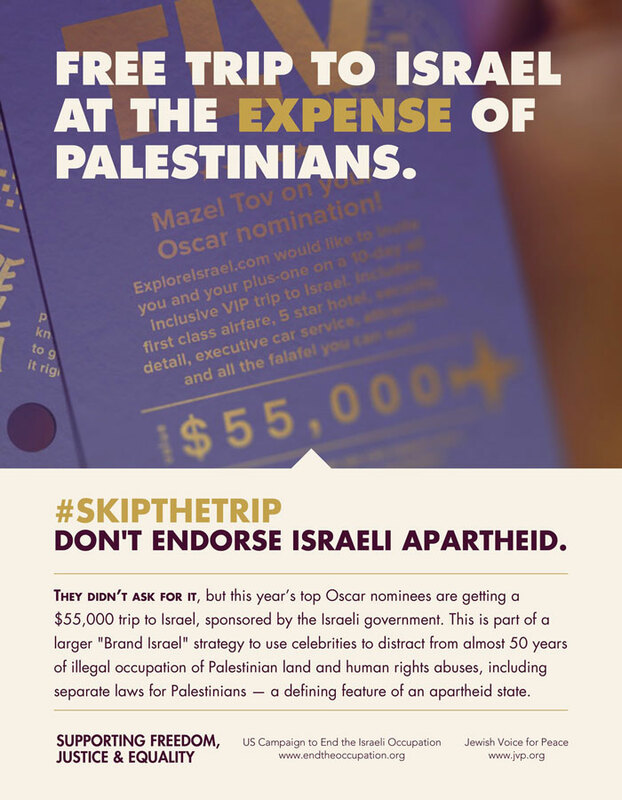 The Palestinian Performing Arts Network, which represents the majority of the Palestinian cultural sector, is also calling on Oscar nominees to #SkipTheTrip, and the Palestinian BDS (Boycotts, Divestment and Sanctions) National Committee, the broadest Palestinian civil society coalition, welcomed the Academy’s moves to distance itself from the swag bags. Jewish Voice for Peace is a national organization inspired by Jewish tradition to work for the freedom, equality, and dignity of all the people of Israel and Palestine. JVP is one of the fastest growing Jewish organizations in the US, with more than 60 chapters and 200,000 members and supporters. The US Campaign to End the Israeli Occupation is a coalition of hundreds of US organizations working to end all forms of US support for Israel’s occupation and apartheid policies. We support freedom, justice, and equality for all.